A year after their poor performance in parliamentary elections, Iran’s hard-line conservatives appear to be reasserting themselves. Their resurgence poses a serious challenge to reformist President Hassan Rouhani, as Iran prepares for a presidential poll in three months’ time. The outcome of the May 19 ballot could determine whether the country proceeds on a path of reform and international integration or distances itself from the West and rolls back efforts to open up its economy. The conservatives – comprising the elite Iranian Revolutionary Guards Corps (IRGC), the military top brass, and the religious establishment led by Supreme Leader Ali Khamenei – have been buoyed by several factors. These include growing tensions with Washington since Donald Trump came to power; their increased influence across the Middle East; and the country’s limited economic gains since international sanctions were lifted last January in return for Iran curbing its nuclear program. Although the deadline for prospective candidates to throw their hat into the ring is still weeks away, a senior aide of Rouhani, the architect of the 2015 nuclear deal, has signaled that the president intends to seek a second term. His opponents have yet to choose a candidate, but they are said to be mulling possible contenders, and will likely rally behind one so as not to split the conservative vote. One prominent hard-line politician seemingly out of the running is the controversial former president Mahmoud Ahmadinejad. Khamenei – Iran’s most powerful political authority – advised him not to stand, saying his participation would “polarize the country.” Ahmadinejad was seen as capable of putting up a strong challenge. Nonetheless, conservatives sense they can defeat Rouhani or at least limit his room for maneuver if he is re-elected, according to some observers. The hardliners – who control the police, security bodies, and the judiciary – suffered a stunning defeat in parliamentary elections last April. Moderates and reformists, riding a wave of optimism following the lifting of nuclear-related sanctions, secured a working majority in the assembly for the first time in more than a decade. Their success was seen as boosting Rouhani’s prospects of winning a second term and continuing his mission to re-engage with the West and encourage trade and investment. To date, however, his reforms have not been sufficient to generate much investor interest. The conservatives, meanwhile, believe that building bridges with the United States and Western Europe risks opening up the country to both liberal ideas – anathema to them – and investors who might threaten their significant stake in the economy. The Trump administration’s hostility toward Iran seems to have emboldened Rouhani’s rivals. They have claimed that the United States is now showing its true colors after the measured, diplomatic approach of the Obama government. Although for now Trump is not expected to follow through with his threat to tear up the nuclear deal, he is likely to enforce it rigorously and punish perceived Iranian belligerence. The IRGC, which has responded to Trump’s actions and rhetoric with its own muscle-flexing, appears to have been buoyed by the expansion of its influence in the region. Through its foreign legion, the Quds Force, and proxy Shia militias, the IRGC is projecting Iranian hard power around the Middle East. Iran-supported groups are key political players in Lebanon; prop up the Assad regime in Syria; neuter Islamic State in Iraq; and battle for control of Yemen. If Trump chooses to crack down on Iran in the next few months, the Revolutionary Guard’s assertiveness at home and abroad could resonate with Iranian voters concerned that the United States is posing a direct threat to their country. Indeed, the head of the Quds Force, Qassim Sulemani, has been mooted by conservatives as a possible presidential candidate. 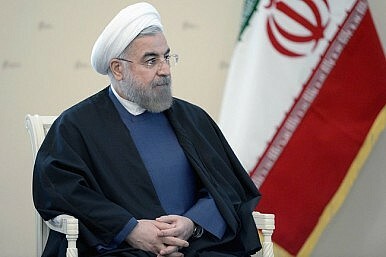 Even before Trump’s election, hardliners sought to undermine Rouhani by berating his failure to deliver tangible economic benefits following the removal of international sanctions. As Khamenei – a reluctant backer of the nuclear deal – recently voiced criticism of the president’s record, Rouhani’s rivals may focus more on the issue. While the lifting of nuclear-related sanctions has led to a surge in oil production that has fueled growth – forecast to reach 6.6 percent this year – remaining American restrictions and uncertainty over U.S. relations with Iran have deterred many European banks and investors from entering the Iranian market. Conservatives will likely play on ordinary Iranians’ belief that living standards have not improved since the nuclear deal. Unemployment stands at around 12 percent – among young people it is as high as 30 percent – with about a fifth of graduates out of work. And as half a million people are expected to join the job market annually over the next three years, Iran’s leaders must ensure that economic progress continues. That is a message that Rouhani and his supporters will probably promote as the presidential election nears. Given the still fragile state of the economy, some observers have suggested that conservatives will not want to be blamed if the nuclear deal collapses. They may prefer, the theory goes, a Rouhani presidency but seek to limit his authority and influence.